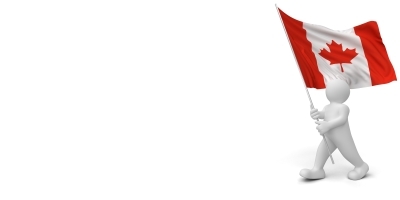 “Canada has dropped out of the top five nations when it comes to integrating immigrants, due to policy changes by Ottawa that restrict family reunification and citizenship. 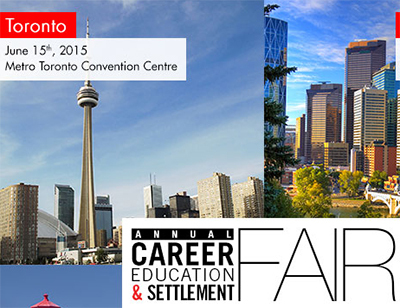 This entry was posted in Uncategorized and tagged brits in toronto, immigration on May 27, 2015 by britsintoronto. Oom pah pah, oom pah pah … some horn … drum roll and … crashing cymbal tish! That’s how we’d introduce the Weston Silver Band (WSB) if the Brits in Toronto crew were as talented as this lot at playing musical instruments. But we’re not, which is why it’s time to say hello to the WSB. Now in its 94th season, the British-style WSB traces its continuous history back to 1921 when it was created as the Weston Boys Band by George Sainsbury from Fawley, England. These days, under the baton of Music Director Larry Shields, the band’s membership is made up of accomplished brass players from the GTA and surrounding areas. Based in Weston (Toronto), the WSB presents a concert series during the fall and winter season in Toronto at CBC’s Glenn Gould Studio, and maintains a busy performance schedule in venues throughout the GTA and southern Ontario in the summer. Set against a dramatic score of rumbling drums and suspenseful trombones building up to an amazing reveal crescendo, we asked the band’s manager, Theresa MacDonald, to explain some more interesting info about the band. How do you get to join the band? Are the band members set in stone or do you constantly look for people who know their way around an oboe? Members are auditioned. The past few years we have had a waiting list for new players but we do keep a list of substitute players for our regular members. Contact us for more info. Re: oboe — we welcome players who know their way around an oboe, as long as they keep it in the case! Our band is brass instruments only (cornet, tenor horn, euphonium, baritone, trombone, tubas and percussion), no woodwinds and of course, no strings attached! You seem to win a lot of competitions, must take a lot of practice! Not knowing how bands work, what happens if some key members can’t make the practice sessions — are there back-up players or how do you get around that? Attendance by all members for once a week rehearsals is expected. If there is a scheduling conflict, we do have a sub list of vetted players who are brought in to cover rehearsals or concerts. Who or how do you decide what tunes to play? Depends on the venue or event. Our repertoire is pretty extensive: classical, jazz and swing, Broadway, folk tunes, marches … even Stevie Wonder! Apart from your Support page, how else do you raise funds? We also earn revenue by concert appearances across Southern Ontario and via our own concert series at Glenn Gould Studio, Toronto and through corporate and private donors (we are a registered charitable organization). How many Brits are in your band, and is there a good social scene? We have had a lot of Brits in the band over the years although none at the present time (one Welshman and Brit on the sub list though). We do have visiting Brits who are brass banders sit in at rehearsals from time to time if they are here on holiday or business. We also have close ties with a lot of UK bands (Black Dyke Band, Cory Band, Flowers Band, and many more, particularly in the North of England and Wales). Also, we have a lot of Brits in our audience. I think the sound reminds them of home, especially those from the north, Wales etc. Brass bands like ours originated in Britain via coal mines and colliery bands and have a very distinct sound and instrumentation. How many times have you played the theme to James Bond? Double ‘O’ seven-ty-thousand times … or it just feels like it! Any other info you’d care to blow your own trumpet about? Our next concert is May 30 at 8:00 p.m. at Glenn Gould Studio in Toronto. Tickets are available online. We’d love to see you there! Here’s the band’s Facebook and Twitter accounts if you’d like to connect. 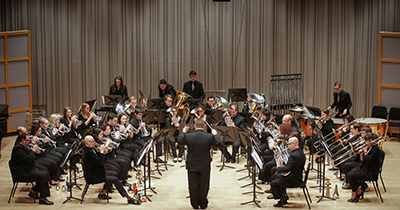 This entry was posted in Uncategorized and tagged brass band, brits in toronto, george sainsbury, weston silver band on May 15, 2015 by britsintoronto. 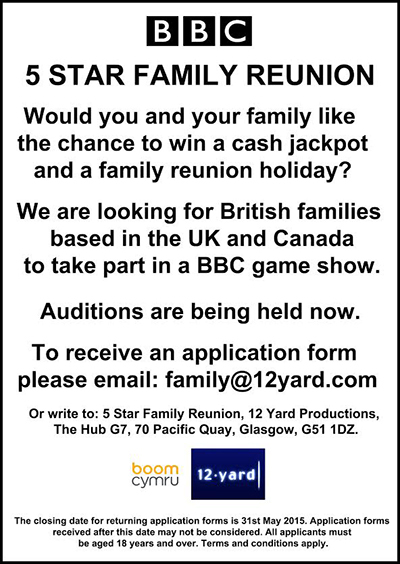 British families in Canada needed for BBC game show … win cash and a reunion! It’s all go at the Brits in Toronto office these days. We got a very exciting e-mail today from a production company called 12 Yard Productions. 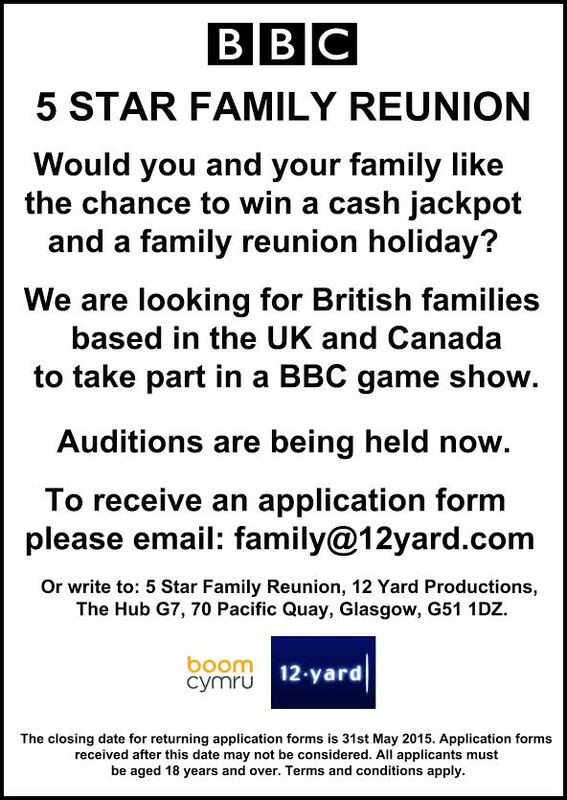 They are making a brand new series for BBC One called The National Lottery: 5 Star Family Reunion. Here’s all the deets. Closing date for application forms is May 31, so get on the dog and bone to Auntie Mildred in Hounslow and start planning your team lickety split! This entry was posted in Uncategorized and tagged 12 yard productions, 5 star family reunion, bbc one, brits in toronto, win a family reunion on May 4, 2015 by britsintoronto. 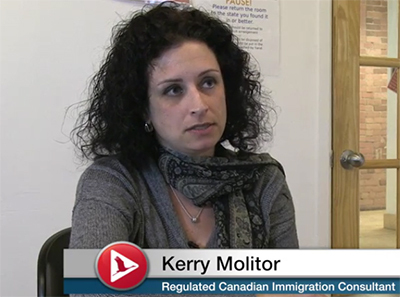 Via the New Canadians website, here’s a useful video about the proposed changes in the Canadian citizenship laws as explained by Kerry Molitor, a regulated Canadian Immigration Consultant. She points out the changes in the application fees, in the time residents have to spend in Canada before applying for citizenship, and in the age range in regard to the language requirements. Also, she explains when the changes will come into effect and if they would affect candidates who have already submitted their applications. This entry was posted in Uncategorized and tagged brits in toronto, canadian citizenship, kerry molitor on May 4, 2015 by britsintoronto.